I tend to buy fabrics with smaller prints for use in quilts, yet I’m often still drawn to busier prints, or those with larger designs. Then I buy them and they sit in my stash because I can’t seem to work them into a quilt top. I decided to come up with a quilt design which would allow me to use one of those great fabrics as the backing along with coordinating prints for the quilt top. The measurements are such so that you can use a single piece of regular width fabric for the backing. 20 corresponding 8.5″ squares of printed fabrics (a layer cake would work really well here, or 1/4 yard cuts or fat quarters). You’ll need 20 different fabrics if you want each to be unique. Or you can duplicate some of the prints, as I did in this quilt, to reduce the number of printed fabrics you need. 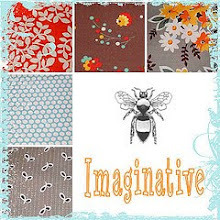 A selection of solid fabrics, totaling just under 1/2 yard. See *notes below for possible variations for the solid sections. First you’ll need to pick a backing fabric. For this one, I used a piece of Alexander Henry My Secret Garden that I had in my stash for a long time. I really love it in its entirety, so I thought it would be perfect to use as a backing. From there I pulled out smaller prints in corresponding colors. I used a total of 17 prints, and used three of them twice. Cut a total of 20 8.5″ squares from these printed fabrics. You’ll make 4 rows of 5 blocks. I arranged mine on the floor, changing them around until I found a layout I liked. 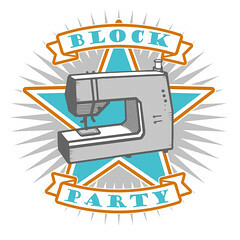 Sew the 5 blocks together for each row and iron all seams. Each row should measure 8.5″ x 40.5″. For the first striped section, sew together the 2″ wide pieces, until you have a strip that’s at least 40.5″ long. 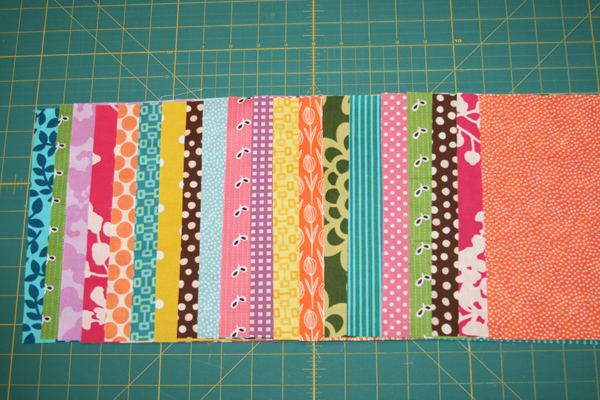 Repeat with the 3″ wide pieces, again sewing them together until it measures at least 40.5″ long. (I staggered my pieces so that the seams in each strip would be offset from the seams in the second strip). Iron all seams, then sew the strips together, sewing along the long side. The 2″ section is on top. Iron that seam. Repeat this process for each striped section. Each section should now measure 4.5″ x 40.5″. Trim each strip to 40.5″ long. Now you’ll sew the first row of blocks to the first striped section. Continue sewing the blocks to the stripes until you have a completed quilt top measuring about 40.5″ x 44.5″. Finish the quilt by sandwiching, quilting and binding using your favorite methods. I quilted this one with a grid pattern, varying the distance between the quilting lines. I was going for a bit of a ‘not so perfectly straight’ look, so I didn’t mark out any of the lines ahead of time. Inspiration for this quilt came from one of the first quilts I made, the original Blocks and Stripes quilt. 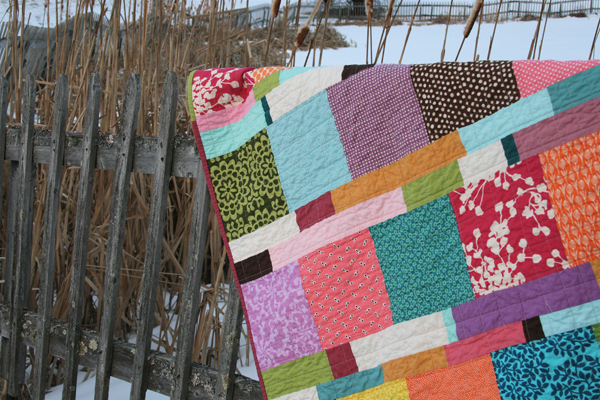 Also, I’d love to see it if youÂ make a quilt from this tutorial! Please be sure to add photos to the Filminthefridge Quilts! Flickr group. This entry was posted in [search] Other Quilts, 2010 Finished Quilts, Finished Quilts, Quilts, Tutorials and tagged blocks and stripes, handmade, quilt, quilting, tutorial. Bookmark the permalink. Good Grief, Ashley! Another awesome quilt. Love the simplicity of it. Will definitely have to make a truly scrappy one like this. Love coming here and being inspired by all of your wonderful work. Love the colors here! So cheerful and vibrant. I also love using the larger squares, especially for those odds-and-ends fabrics that can be hard to fit into a more intricately pieced block pattern. Plus, using up scraps for the sashing is always a bonus. Thanks for sharing this inspiration! 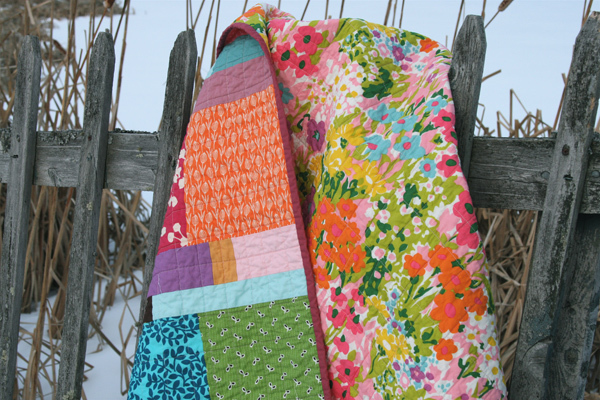 I absolutely love this quilt…the combinations, the colors…what an amazing inspiration! Thanks! This is a great quilt. Nice to have an idea of what to do with those beautiful fabrics with large designs. Thanks for the tutorial. Love, love , LOVE this quilt! I saw that orange/white flower/tulip material a while back, but can’t remember where or who the designer is. Can you refresh my memory–I NEED some! Thanks! Thanks Rachel! The orange print is one by Carolyn Gavin, from her Wild Thyme line. another AWESOME quilt!! thanks for sharing the tutorial! Hmmm… I have a Plume FQ bundle set aside to make a quilt for a friend… I think this might be a good design for it; what do you think? You are the best! I will be making one of these! Ashley….can’t keep up with you.!! 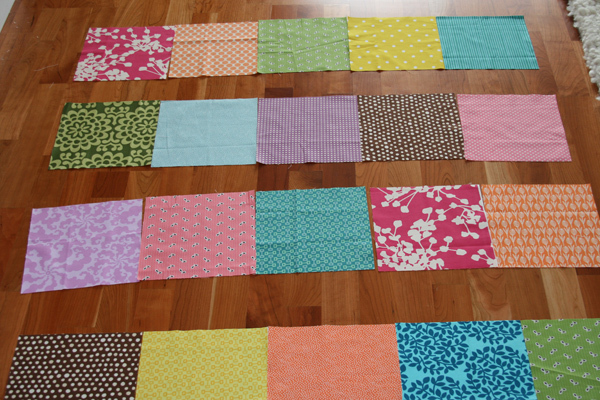 I am into Bento Box right now and another quilt using cottton/linen…..oh, mgosh…. I love the colors you chose.. and especially the backing! It reminds me of a vintage sheet. I hadn’t seen that one before – it’s on my wish list now! Oh I like it …. printing it out now. Thanks. Love love love it Ashley, as usual!! I just finished a quilt where I had picked the large scale back and then did the front after. Loving your voile string quilt, might attempt soon…..
Super cute quilt that is perfect for showcasing fabrics. Love it! Ash, Gorgeous! Love the colors! Also, your photos are awesome. Snowy! Snowy! Ashley, what a colorful, beautiful quilt. I love fabric on the back. Thanks Ashley! 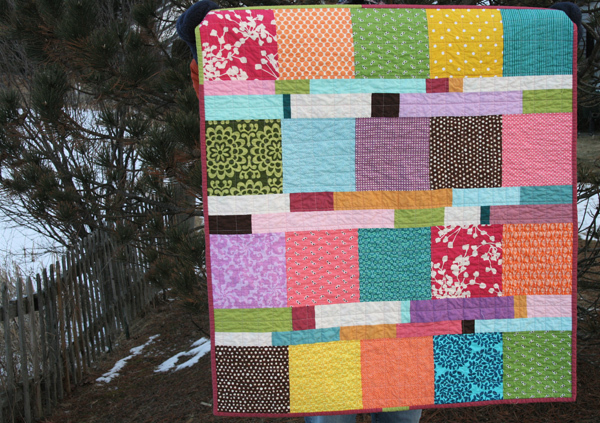 I love the vibrant colours in this quilt – fantastic!! I love this! Thanks so much for the specifics, I’ll be linking. I LOVE the back! Do you have a picture of it? LOVE that fabric! What a very nice quilt. Love the colors and arrangement. LOVE the back! And really like your solid stripes. Oh, this quilt is gorgeous ! I just love your free style ! Gosh that quilt is lovely. In some ways a simple design but the fabrics just sing. I love this and I’m thinking this might be the quilt I’m looking for to use my Katie Jump Rope stash. I do have a question. I’ve never done a quilt and I’m very hesitant to do machine quilting. Do you think this quilt would be nice as a tied quilt? Can any quilt regardless of the piecing work well as a tied quilt or are tied quilts usually just plain square piecing? I found your quilt via whipup and I love it. I find a lot of quilts (and quilt fabrics at most chains)a little fussy for my taste. I love that this lets bold graphics shine through. Gorgeous! I think this is a gorgeously colorful quilt! And (like most others seem to) I LOVE the fabric you used for the backing of the quilt. Can you post the designer’s name and specifics? I’d love to get my hands on it! very cute… looks similar to the play school quilt i made 2 weeks ago too! Awesome! Love it! I’ve found my quilt-to-do for the month of February. Will make sure to post on flickr group. Thanks for the inspiration! Wow! This is beautiful! I love how you mix up the big blocks with the thin pieces. Very nice on the eyes. Funny, I first saw this quilt on the whipup site and new immediately that it was yours! I have to say that I also love the way it looked layed out on white, so I’m thinking of trying it that way. I totally agree!! I am going to use this pattern with pinks and whites for a little girl in the hospital – Thank you so much – it is beautiful. This is soo cute i love it!!!! What a great idea it incorperates a lot of fabric. Just stumbled upon your blog.. and this has to be one of my favorite quilts Iâ€™ve seen so far!!! great job!! a quick question: what is the batting material of this? I’ve been following your blog for a long time ever since I bought and commissioned some quilts from mr. monkeysuit. You clearly have a lot of admirers and are deserving of them. You are an amazing quilter. I am a beginner quilter and hope someday to be at the level you are and as involved in diffeent groups and virtual bees as you are. I am in my first bee, “The Fussy Cut Quilting Bee” and am looking to join one more. I really want to work on my technique before I spread myself too thin. As my skills improve I can see that the more specific groups I’m in my skills will also improve. In the meantime, you’re on my blog list so I’ll keep on peeking in. Thanks for giving me a chance to admire your work. This quilt reached out and grabbed me – seriously! Soon I will be making a baby quilt for my niece’s first baby and this looks perfect for that. The women in my family are providing me with 1/4 yard of baby flannel (their choice of color and design) and I’m to make a quilt from those. Can you imagine the challenge? I’m sure your design will work out nicely. Wish me luck! I love your quilts!! A quick question- do you pre-wash your fabrics? Or do you just wash the quilt once it’s made? Thanks! 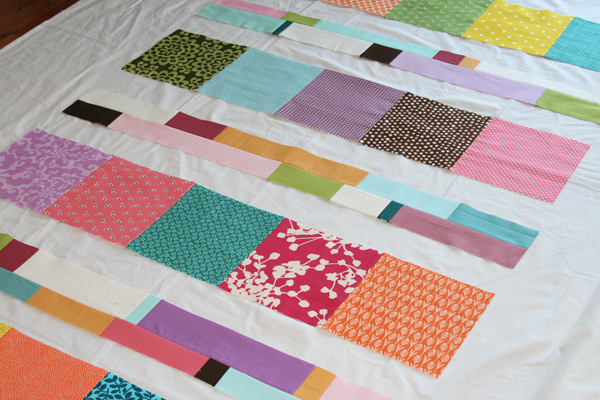 I am hoping to make this blocks and stripes quilt soon, so I will post a pic when I am done! Love this, our club is making quilts for St Jude and plan to bring this up! Gorgeous! I love it and want to have a go making something like it. Thanks for your tutorial – this and the others are so helpful for novices like me. Really appreciate it. I just love this quilt! I will be making one this month for a friend that’s expecting. Thanks for sharing such a great idea and such beautiful work!! I love this tutorial. Thanks so much for sharing . Very well explained.